"At the Intersection: Art, Money and Politics" participants, from left to right: Jan Cohen-Cruz, Randy Martin, Morgan Jenness, moderator Amy Whitaker, series curator Andy Horwitz, Rachel Chavkin. Photo by Whitney Browne. 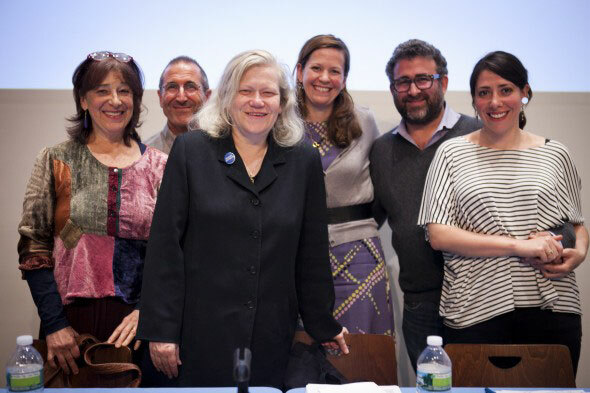 On April 11, 2012 Jan Cohen-Cruz, Randy Martin, Morgan Jenness , Rachel Chavkin and moderator Amy Whitaker came together at the Broad Street Ballroom of Léman Manhattan Preparatory School near Wall Street for a discussion called “At The Intersection: Art, Money and Politics” as part of LMCC’s Access Restricted series, curated and produced by Culturebot’s Andrew Horwitz. This conversation is available as a podcast at artonair.org. This is the first of what we hope will be a series of thoughtful conversations and essays about issues related to the intersection of art, money and politics.